This entry was posted in Philosophy, Theology and tagged Bertrand Russell, pragmatism, truth, William James. Bookmark the permalink. I think Russell is misconstruing James with regard to pragmatism. He is making James claim a more extreme version of pragmatism in belief than James took. This makes a strawman out of James. James, in writings such as “Will to Believe,” is specifically addressing areas where one is put in a position where a belief is called for when one does not know for certain what is true or false in other ways. 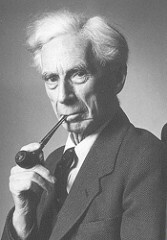 James accepted that people can know that things are true or false independently of whether such a facts’ truth “makes them happy.” It is specifically with things that are not assignable a truth value by other, more ordinary means — things that require faith, not sight — that it can make sense to choose a belief in view of that belief’s likely consequences. Russell is quoting directly from James’s Pragmatism (1907) which was published a decade after “The Will to Believe” and further develops his pragmatist theory of truth.